The Tank Museum Bovington has the largest collection of military tanks from World War 1, 2 & recent. These historic military vehicles and all other large objects have always been key entities, which provide a wealth of information and insight into the past design process, design methods, materials and manufacturing techniques. These rare & historic collections are valuable assets for our present and the future generation. These historic vehicles like any other museum artefacts are associated with deterioration due to aging mechanisms such as corrosion, stress corrosion and fatigue crack propagation and wear in the interacting surface. Large military vehicles such as military tanks were exposed to extreme physical and environmental conditions during the war, in addition after the war the vehicles were left unattended for an unidentified period in the uncontrolled environment resulting accelerated aging mechanisms. Corrosion is one of the growing persistent problems in the military vehicles in the Tank Museum at Bovington. 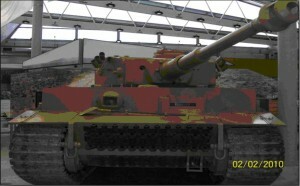 The historic vehicles are stored in the museum in two distinct controlled and uncontrolled environments with a transitional mode when vehicles move between the two. Varying environmental conditions together with operational factors pose a significant risk to the vehicles. To preserve these vehicles in a valuable state for the benefit of the society, sustainable conservation techniques are required to slow down or suspend the deterioration within these historic vehicles. Extraordinary interests and efforts of the Director of The Tank Museum at Bovington Mr. Richard Smith and Professor Mark Hadfield, Director Sustainable Design Research Centre (SDRC) at Bournemouth University lead to the design of a research project between BU and the Tank Museum. Mr Adil Saeed has been conducting important research under the supervision of Dr. Zulfiqar Khan co-director SDRC, Dr. Nigel Garland and Professor Mark Hadfield as mentor. Adil was recently invited as guest speaker by Forensic Institute Cranfield University at Shrivenham where his guest lecture was well attended and received. In addition Adil has also presented the outcome of the ongoing research in the Department of Materials at Oxford University, where member of the research consortia and Oxford university staff attended the presentation. Recent research outcomes and results were also presented in a paper at an international conference of Society of Tribologists and Lubrication Engineers (STLE) in May 2011 at Atlanta, Georgia. STLE is highly reputable organisation with members around the world. The conference in May attracted around 400 papers with well over 1000 delegates, 70 multinationals industrial participants and 40 student posters. The aims of the research are to indentify the aging mechanisms such as corrosion, stress corrosion and fatigue cracking, failure due to static and dynamic stresses including the role of residual stresses, deterioration in the interacting components and other potential risks in the historic vehicles through non-destructive methods and develop sustainable methodology for the preservation of these vehicles in different museum environments.